This past Friday, I finally saw a movie at my local drive-in theater, which I just love visiting as much as I can. My mom, sister, and I headed out to see the movie Christopher Robin, starring Ewan McGregor as the title character. While the drive-in shows at least two movies, we had already seen the second movie (Ant-Man and the Wasp) so we opted just to stay for Christopher Robin. It was such a lovely film and it’s one that I will happily be buying when it releases. I know that drive-in theaters are pretty rare these days in the United States, but thankfully, I still have one fairly close to my house called Starlite Drive-In. I try and visit at least once every summer, so this past Friday was the first time I’ve been in 2018. I’d love to go one more time though as it’s definitely a fun experience. Throughout the summer, they are open every day but Monday, but now it’s only open Friday-Sunday. Tickets are $8.75 for anyone 12 and over and that’s usually to see two movies – sometimes there will be three in one night! This is such a great deal as seeing just one movie in most theaters is $10 or $11. If you bring in outside food, you do have to pay $5, but that’s a good deal since they make so much of their money through concessions. Ahh…concessions. They have some really great food at Starlite. This Friday we all got drinks, I got a soft pretzel, my mom got popcorn, and my sister got popcorn and twizzlers and everything was super yummy. I saw on their menu they have grilled cheese donuts this year and I need to go back just to get that. 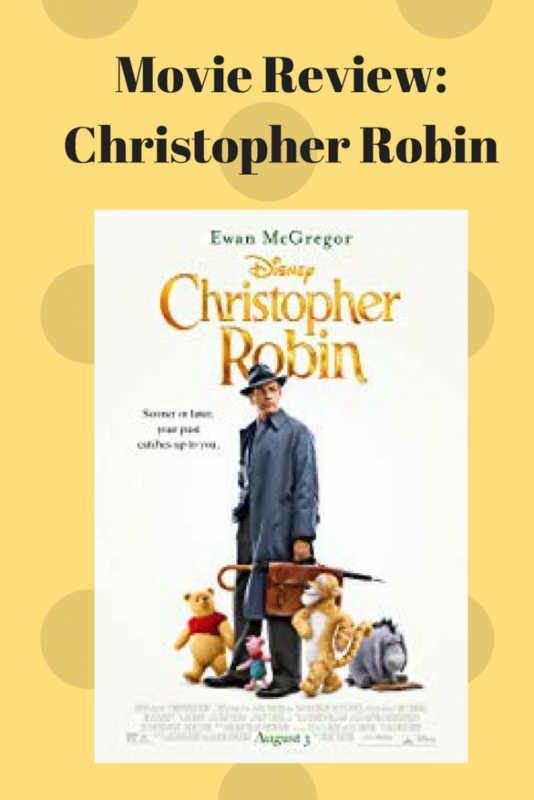 Christopher Robin is a movie that I think kids could see, but it’s not a typical kid movie. I really loved that it starts with Christopher Robin as a child playing in the woods with Winnie-the-Pooh and the gang. After this opening scene, we don’t see the animals for a little while, as we get to know who Christopher Robin is as an adult and how he’s become so focused on work, he misses out on a whole lot of play! Eventually, Winnie-the-Pooh does show up again – this time in London – and he needs Christopher’s help finding the rest of his friends. Can I just say that you’ll probably tear up watching this movie? I know I definitely did, as well as my mom and sister. It’s really an emotional film. Winnie-the-Pooh and friends might be stuffed animals, of sorts, but they have real feelings and half of what Pooh says made me cry! I just wanted Christopher to go live in the woods and be with his friends again. I loved when Christopher’s young daughter starts to play a larger part in the film. It’s almost like a young Christopher finding Hundred Acre Woods all over again, and it’s just beautiful. I think this was a really well done film and I definitely want to own it on DVD when I can. I’d love to know what others have thought – have you seen it yet? If not, do you want to watch it? Let me know in the comments! I have not been to a drive-in since I was in high school (a very, very, VERY long time ago), and it was in PA. This movie looks delightful, and you make it sound even better. Glad you enjoyed it. Aww yay!!! I can’t wait to go see this one! I was really hoping this would be good because all the trailers I saw for it were. So glad you liked it! We really liked Christopher Robin. I would love to go to a drive-in with my kids but for some reason, the ones here play their kids’ movies second, which makes them really late! Wow I would love to take my little to a drive in! Winnie the Pooh was one of my favorites growing up. I can’t wait to see this one! Eeyore is my favorite 🙂 And I think they picked the perfect voice for him too! LOL . We have a drive in on the other side of town but haven’t been yet. One of these days! Thanks for sharing!!! I used to go to the drive in with my parents. The first movie I watched there was Stuart Little! Glad to hear you liked this one. I have been debating whether to see it. My family members are big fans of these characters, my one sister’s nickname is Tigger. So I’ll have to go see this one. I haven’t been to a drive-in in a long time! Used to love to go though! I know there is at least one in my area still. I’m so glad to read a positive review of this movie, our local critics here didn’t like it. I really want to see it, all the previews made me cry so I’m sure I’ll need some Kleenex. I would love to go to a drive-in sometime, I need to see if there is anything like that around here! I haven’t been to the drive-in since I was very young. They are rare here (I actually don’t know of anyone that has been in years) but I remember how much fun it was. The movie sounds great and those snacks sound SO good! Grilled cheese donuts? Yes please! I took my niece to see this film last week and we both absolutely loved it. I loved that the animals looked a little tatty. I grew up going to the drive-in movies in the summer, but now we don’t have one close. I love that you and your family went. We don’t have any drive ins in Portland. I wanted to go to the one in Idaho Falls, my home town, but is closed right now. I am hoping it will reopen. I can’t wait to see Christopher Robin. It sounds wonderful. Glad you enjoyed this adaptation. I know I’m going to cry when I see it, so I’m hyping myself up. I haven’t had the chance to see it yet, but I really want to. It sounds like such a cute movie. I would also love if we still had a drive-in close by. The last one closed down last year. great review! I LOVED the Christopher Robin video! I have always wanted to go to a drive-in movie theatre! Thanks for sharing your experience, I am going to have to find one near me to go to! Glad to hear about the movie as well! My big kids went to see this when it first came out and they really liked it- Liv is reading the book now. It is sad that there are not many drive ins left anymore. I remember going even in my teen years and having a great time. There are a couple that are close enough that I could go but I don’t know if I could stay awake to drive an hour home after the movie ends since they start so late. I am old in case you didn’t guess 🙂 I do want to see this movie. I haven’t seen this one, but I saw the preview and totally want to see it! It looks amazing! This is one I definitely want to see! A drive in sounds so fun! I know there’s one not far from me so I really need to go check that out. This sounds like such a sweet movie too! The last time I was at a drive in was in college when I lived in Georgia, and it was a Starlite as well!! This movie sounds super cute, I will have to add it to my list to watch when it comes out on blue-ray. A drive in would be cool but we don’t have any around us. My kids and I really want to see Christopher Robin. Glad you enjoyed it! I’m surprised I haven’t gone to see this with the kids yet! We have a drive in, but it is about an hour away… so, not sure if we’ll ever go out to see a movie there. Oh I definitley would’ve sampled the grilled cheese donut 🤣 thanks for this review! I really want to see it. It was playing at our local drive-in last weekend and I almost put the kids in the car and went. Hopefully they’ll have a family friendly movie we can go see this weekend. How wonderful to still have a drive-in near you. I have such great memories of going as a kid. I adored the Christopher Robin movie and thought it was simply precious. And I definitely teared up a time or two. Aww I definitely have to give this film a try when we can. This was a fave as a child and I am interested to see the perspective they took with it. I love drive-ins, and where I grew up we had a drive-in we used to go to- so fun! I used to love going into the concession stand lol. There’s still a few around but none super close to me, unfortunately. Glad you have one close by, that’s a treat! I saw this and loved it to. There were so many hidden gems of sweet playfulness and pretty deep thoughts pulled into those moments. Glad you enjoyed it too! Glad you had a good time at the drive-in! My hubby LOVES it! My daughter would absolutely love this movie so YES thank you for the review we will watch it! Was just noticing that Christopher Robin is at our local theater. Glad to hear you enjoyed the movie (and the drive-in). Maybe I will go see it this weekend while my Prince is away from the castle. I believe going to the drive-in was on your summer bucket list. Way to mark another activity off the list. I have very fond memories of drive-ins from childhood.